Erik Knudsen wears black low cut Converse “Chuck Taylor” All Stars in the series. 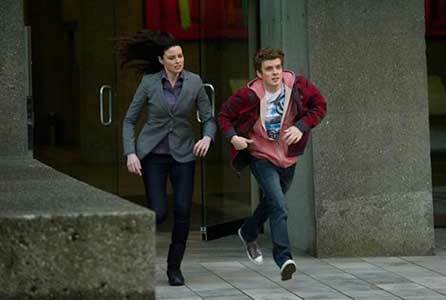 Alec and Kiera make a run for it. In a wonderful, edgy whirl of time travel and futuristic technology, Continuum takes its viewers back and forth between 2012 and 2077 in a complex plot surrounding Kiera Cameron and her allies. A Law Enforcer living in the future in Vancouver, she finds herself transported back to the year 2012 and works to return to her family in 2077 before Liber8, a radical, anti-corporate activist group, takes over. Kiera is joined in her adventures by Carlos Fonnegra and by the quirky and endlessly brilliant Alec Sadler. Alec and Kiera, played by Erik Knudsen and Rachel Nichols. Played by Erik Knudsen, Alec seems to be the strong, unspoken hero of the show. 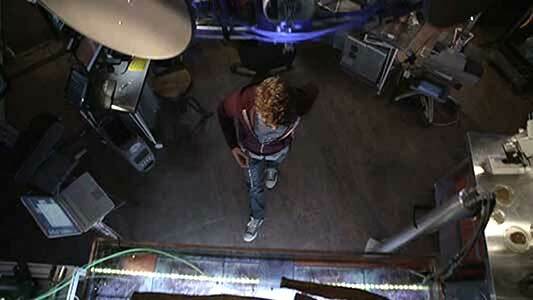 He is able to communicate with Kiera early on, when she first traveled back from the future. He is the only person who knows who truly knows her identity and story, and becomes her closest ally, despite only meeting her occasionally. Alec has a difficult family situation, and is very closed off and introverted. What he lacks in social skills he makes up for in technological adeptness and knowledge, and proves extremely to Kiera in her fight against Liber8. He works in his technology based office, full of computers and gadgets, in his father’s old barn, and communicates with Kiera through a CPS system. He has a vast understanding of all things technological and cyber, even being able to work with technology from the future, such as Kiera’s protective body suit. Alec is safe from the world in his office, or so he thinks…. Alec is a complex character, who, at first glance, seems emotionally distant from all those in his life. However, as the show continues, he develops a deep connection with Kiera, and expresses emotions of loyalty and protectiveness towards her. Furthermore, despite his differences with his various members of his conspiracy driven family, he feels compassionate tendencies for his stepbrother Julian, whom he protects despite Julian’s alliance with Liber8. Alec is young, a seemingly typical teenager, save for his unbelievable technological adeptness and genius mind. He dresses in slouchy sweatshirts and faded chucks, and acts immature and anxious at times. In later seasons he develops a character in the future, one who takes over a major tech company called SadTech, and who works with Liber8 to take down Kiera and his past self in 2012. Both his past and future self are sharp and incredibly quick-witted, and Alec’s character adds a complex layer of youthful wit and energy to the fast-paced, science fiction show. 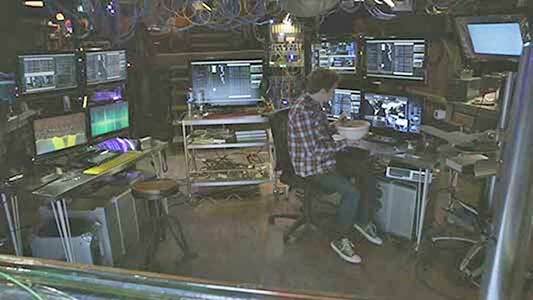 Alec in his technological lair.